Before :- R. Bhaskaran and K.T. Sankaran, JJ. IMPORTANTIndigent person granted permission to file money suit by paying 1/10th of court fee - Court can withdraw the permission when money becomes available with him. For the Petitioner :- Dinesh Mathew, J. Muricken & P.V. Balakrishnan, Advocates. Jayaraja Menon v. Rajakrishnan, 1998(1) RCR(Civil) 236 : 1997(1) K.L.T. 813. M.L. Sethi v. R.P. Kapoor, A.I.R. 1972 S.C. 2379. Mathew v. State of Kerala, 1996(2) K.L.T. 363. Gadigi Muddappa v. G. Rudramma, A.I.R. 1921 Madras 97. Rustamji Cawasji v. General Cotton Mills, A.I.R. 1967 Bombay 73. K.T. Sankaran, J. - The question involved in this appeal is whether a plaintiff who has paid only 1/10th of the court fee along with the plaint and who has sold a substantial item of immovable property after the institution of the suit could claim to be an indigent person and maintain an application under Rule 1 of Order 33 of the Code of Civil Procedure, in so far as the balance court fee is concerned. 2. The appellant instituted O.S. No. 533 of 1996, on the file of the Additional Sub Court, Thrissur for realisation of a sum of Rs. 5,46,760/- from the defendants. The court fee payable is Rs. 39,307/-. Along with the plaint, the appellant paid Rs. 4,000/- as court fee as 1/10th of the court fee payable under Section 4A of the Kerala Court-fees and Suits Valuation Act, 1959. Written statement was filed by the defendants on 12-09-1997 and they also preferred a counter claim on that date. However, issues were framed only on 6-11-2003 and the appellant/plaintiff was directed to pay the balance court fee. After the institution of the suit, the appellant/plaintiff sold an extent of 13 cents of land with a two storeyed building on 21-5-1998, as per Ext. B1 assignment deed, for a consideration of Rs. 2,50,000/-. On 22-11-2003, the plaintiff filed I.A. No. 6663 of 2003 under Rule 1 of Order 33 of the Code of Civil Procedure. The prayer in the application is to "exempt the plaintiff" from payment of the balance court fee. In the affidavit accompanying the application, it is stated that the plaintiff has no income or financial capacity to pay the balance court fee. 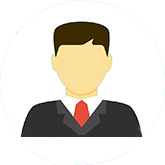 It is stated that he has no job and he is not possessed of any saleable property. The execution of Ext. B1 dated 21-5-1998 is not disclosed in the affidavit. It is also not stated in the affidavit that the plaintiff has not, within two months next before the presentation of the application, disposed of any property. I.A. No. 663 of 2003 was opposed by the defendants. It was contended by the defendants that the suit was filed on 15-5-1996 and the relevant date of considering whether the plaintiff was indigent was the date of filing of the suit. They also contended that the plaintiff owns movable and immovable properties and that he is a contractor. The application was filed without disclosing the assets belonging to the plaintiff. 3. Before the court below, the plaintiff adduced evidence as PW1 and the first defendant as RW1. The plaintiff stated in evidence that he is an Ex-serviceman and he gets a monthly pension of only Rs. 1,900/-. He has to maintain his family consisting of six members and the amount of pension is not sufficient to maintain his family. A suggestion was made in cross-examination to PW1 that he gets a pension of Rs. 5,4000/- per month. The pension book was not produced by the plaintiff. It was admitted by PW1 that he sold 13 cents of land with a two storeyed building to one Wilson Chittilapilly on 21-5-1998. It was suggested to PW1 that he transferred his property to defeat the counter-claim of the defendants and that the sale consideration of Ext.B1 was used by the plaintiff for purchasing property in the name of his wife. In the evidence of RW1, it was stated that the property sold by the plaintiff consisted of a two storeyed building having a plinth area of 2500 sq.ft. and that the property was sold for a consideration of Rs. 12 lakhs. He stated that for evading payment of stamp duty and income tax, the sale consideration was shown as Rs. 2,50,000/- in Ext.B1. An explanation was offered by PW1 that the sale consideration of Ext.B1 was utilised for discharging his debts. However, no oral or documentary evidence was made available before the court to prove the same. 4. The court below dismissed the application by the order impugned in this appeal. The court below held that the plaintiff is not entitled to maintain an application under Rule 1 of Order 33 after disposing of a valuable item of immovable property after the institution of the suit. The court below also took the view that the relevant date for considering whether the plaintiff is an indigent person is the date of filing of the suit. 5. Order 33 of the Code of Civil Procedure is intended to protect the interest of an indigent person who is unable to pay court fee at the time of institution of the suit. Explanation I to Rule 1 of Order 33 provides that a person is an indigent person if he is not possessed of sufficient means to enable him to pay the fee prescribed by law for the plaint. Explanation II to Rule 1 of Order 33 says that any property which is acquired by a person after the presentation of his application for permission to sue as an indigent person and before the decision of the application shall be taken into account in considering the question whether or not the applicant is an indigent person. Rule 2 of Order 33 provides that every application for permission to sue as an indigent person shall contain the particulars required in regard to plaints in suits and that a schedule of movable or immovable property belonging to the applicant with the estimated value thereof shall be annexed thereto. Rule 5 prescribes that the Court shall reject an application for permission to sue as an indigent person in the circumstances mentioned in any of the clauses (a) to (g) of the Rule. Clause (b) thereof provides that the application shall be dismissed where the applicant is not an indigent person. Clause (c) stipulates that where the applicant has, within two months next before the presentation of the application, disposed of any property fraudulently or in order to be able to apply for permission to sue as an indigent person, the application is liable to be rejected. Rule 6 contemplates an enquiry and hearing if the application is not rejected under Rule 5. Rule 7 prescribes the procedure at hearing. After hearing, the court shall either allow or refuse to allow the applicant to use as an indigent person. Rule 9 of Order 33 provides that the court may order that the permission granted to the plaintiff to sue as an indigent person be withdrawn if any of the clauses (a) to (c) is attracted. 6. The question to be decided is whether a person who has paid one tenth of the court fee on the presentation of the plaint could file an application under Order 33, Rule 1 C.P.C. at the time when he is liable to pay the balance court fee under Section 4-A of the Court-fee Act. Another question to be answered is whether in such a case the indigency of the plaintiff is to be determined with reference to the date of presentation of the plaint or the date when the application under Order 33 rule 1 is made. Yet another question to be decided is whether the plaintiff having disposed of his property for consideration after the institution of the suit could claim to be an indigent person thereafter. 7. 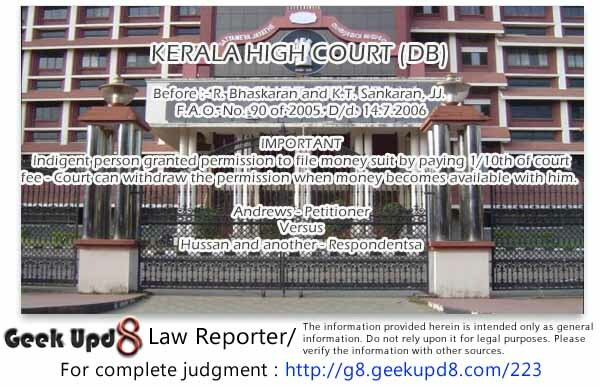 Section 4-A of the Kerala Court Fees and Suits Valuation Act was inserted by the Amendment Act 6 of 1991. Section 4-A provides that the amount of fee to be paid on plaint at the time of institution of suit shall be one-tenth of the amount of chargeable under the Act and the balance amount shall be paid within such period, not later than fifteen days from the date of framing of issues or where framing of issues is not necessary, within such period not exceeding fifteen days as may be specified by the Court. Section 4-A of the Court Fees Act only postpones the payment of court fee. Court fee is payable on the valuation of the suit as on the date of the suit, at such rate of fee liable to be paid as on the date of suit. In the case of an indigent person, the suit shall be deemed to be instituted on the date when the application under Order 33 Rule 1 is made. Section 3(2)(a)(ii) of the Limitation Act provides that for the purpose of the limitation Act, a suit is instituted, in the case of pauper, when his application for leave to sue as a pauper is made. Rule 8 of Order 33 of the Code of Civil Procedure states that where the application is granted, it shall be numbered and registered, and shall be deemed the plaint in the suit, and the suit shall proceed in all other respects as a suit instituted in the ordinary manner, except that the plaintiff shall not be liable to pay any Court fee. Where an application to file the suit as an indigent person is rejected under Rule 5 or an application is refused under Rule 7, the Court may grant time to pay the court fee. Rule 15-A of Order 33 states that upon such payment of court fee, the suit shall be deemed to have been instituted on the date on which the application for permission to sue as an indigent person was presented. 8. The aforementioned provisions of law would, on a literal construction, indicate that the relevant date for determining the indigency of the plaintiff is the date of presentation of the application for leave to sue as an indigent person. But, there may occasional cases where a plaintiff may pay one tenth of the court fee at the time of presentation of the plaintiff and may, quite honestly, hope to pay the balance court fee within time, nevertheless, later he may become a pauper, for reasons beyond his control. It may happen that his properties are lost by act of God; or his properties and assets are sold or realised at the intervention of the court for realisation of his debts; or he was compelled by pressing needs to spend the money kept aside by him for payment of balance court fee and there is no realizable asset presently. These examples are not exhaustive. In such cases, law would and should come to his rescue and grant leave to continue the suit as an indigent person in so far the balance court fee is concerned. To our mind, in such cases, the fiction by which the date of institution of the suit is related back to the date of application for leave to sue as an indigent person, would not deprive the plaintiff to avail the benefit of Order 33 C.P.C. 9. The position would be different if the plaintiff sells his property after the institution of the suit and diverts the money without paying the balance court fee. Though Section 4-A postpones the payment of nine-tenth of the court fee to a later point of time, the plaintiff is bound to pay the balance court fee. When he realizes money by sale of his property, he should pay the balance court fee or keep aside the same for payment at the time when it becomes payable. The plaintiff cannot be permitted to say that he has not disposed of the property "within two months next before the presentation of the application" for leave to sue as an indigent person as envisaged in Rule 5(c) of Order 33 C.P.C. and escape the liability to pay balance Court fee. Clause (c) of Rule 5 provides that the court shall reject an application for permission to sue as an indigent person where he has, within two months next before the presentation of the application, disposed of any property fraudulently or in order to be able to apply for permission to sue as an indigent person. It contemplates a situation where the suit is originally filed by the plaintiff as an indigent person by presenting an application for leave to sue as such. The time factor mentioned in Rule 5(c) cannot be regarded as a shield to overcome a fraudulent transfer after the institution of the suit or a transfer after the suit to enable the plaintiff to apply for permission to sue as an indigent person, in so far the payment of balance court fee is concerned. In this context, Rule 9 of Order 33 becomes relevant. Where plaintiff had originally filed the application for leave to sue as an indigent person and the court had allowed the application, still, the Court could invoke Rule 9 of Order 33 C.P.C. and withdraw the permission granted to sue as an indigent person, if it appears that the means of the plaintiff are such that he ought (not) to continue to sue as an indigent person. Where the plaintiff sells his property after the institution of the suit and realises the proceeds, the Court could invoke Rule 9 and direct the plaintiff to pay the court fee. Would the position be different if the plaintiff pays only one tenth court fee at the time of institution of the suit and sells his property later ? To our mind, it would not be. "The right to file a suit or prosecute a suit as an indigent person is dependent on the fact that the plaintiff who is suing is an indigent person. As observed in M.L. Sethi v. R.P. Kapoor, (A.I.R. 1972 S.C. 2379) every defendant in a suit enjoys an immunity from a suit being filed unless the requisite court fee is paid by the plaintiff and that right is a valuable right. Order 33 provides for a contingency where the plaintiff is not in a position to pay the court fee and reflects the policy of the law that a person shall not be deprived of his rights, merely because of his inability to pay the court fee. Order 33 of the Code of Civil Procedure does not exempt the plaintiff even if he is indigent, from paying the court fee. It only postpones the collection of the court fee. It is, therefore, clear that a plaintiff can resort to Order 33 of the Code only if he is an indigent person". "Under the scheme of Order 33 of the Code, a plaintiff is exempted from paying the court fee that is payable by any other litigant who comes to court for relief at the time of institution of the suit on the ground that he is not in a position to pay the court fee. If a plaintiff seeks such a special privilege to pursue his litigation, is there any reason not to insist on his strictly complying with the requirement of Order 33 of the Code and coming to court with clean hands ? According to us, there is no jurisdiction for removing the immunity available to the defendant in a suit and to grant a right to the plaintiff to prosecute the suit without payment of the Court fee unless the plaintiff comes to court with clean hands, making a disclosure of all his assets." 12. In Jayaraja Menon's case, 1997(1) K.L.T. 813, the plaintiff was granted leave to sue as an indigent person. Later, he got the retirement benefits sufficient enough to pay the court fee. An application under Rule 9 of Order 33 was filed to withdraw the permission granted to sue as an indigent person. It was contended by the plaintiff that the retirement benefits are exempt from attachment under Section 60 of the Code of Civil Procedure and, therefore, it cannot be reckoned for the purpose of deciding means of the plaintiff to pay court fee. This contention was negatived by this Court. Relying on the decision of the Madras High Court in Gadigi Muddappa v. G. Rudramma, A.I.R. 1921 Madras 97 and Rustamji Cawasji v. General Cotton Mills, A.I.R. 1967 Bombay 73, it was held that once the plaintiff had come by monies and had ceased to be a pauper after the date of the application for permission to sue as an indigent person, that plaintiff has to be dispaupered and he would be disentitled to revive his application for permission to sue as an indigent person by contending that he had spent that money or had used it for other purposes. 13. In the light of the evidence on record in the present case, we are not inclined to accept the case of the appellant-plaintiff that he utilised the sale proceeds of Exhibit B1 sale for discharging his debts. The appellant- plaintiff has not disclosed the same in his affidavit in support of the application. Relevant facts were suppressed by him. He did not take the court into confidence. Exhibit B1 shows that the consideration for the transaction is Rs. 2,50,00/-. Balance court fee payable is only Rs. 35,307/-. For the above said reasons, we confirm the order passed by the court below, though not for the same stated by the Court below, and dismiss the Appeal with costs.